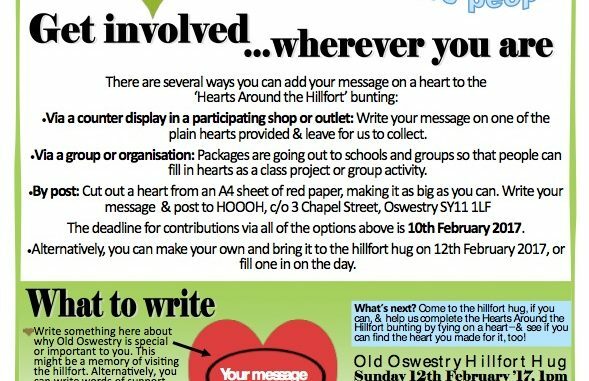 Oswestry will be displaying its affection for local heritage and greenspace in a landmark initiative as part of annual celebrations devoted to Old Oswestry hillfort. The town is aiming to encircle the 3,000 year old Iron Age monument with a 1 km long chain of people and string of hearts with messages of appreciation for the hillfort from all parts of the community. The ‘Hearts Around the Hillfort’ project is set to provide an eye-catching focus to this year’s hillfort hug on February 12, organised by the HOOOH Community Group. The group is also keen for hearts in support of local greenspace and heritage in general. HOOOH estimates that around 650 people will be needed to form a complete human chain around the hillfort top. The group stresses that the event is being organised and stewarded with due care for the monument and people’s safety. Now in its third year, the hug is part of a weekend of events taking place February 11 and 12 celebrating one of the country’s largest and best preserved hillforts. Old Oswestry has been acknowledged by eminent academics as the ‘Stonehenge of the Iron Age’ due to its importance to the archaeological understanding of Celtic Britain. A full day’s seminar will be held in Oswestry Memorial Hall on February 11 examining wider aspects of the hillfort’s role, including its natural heritage and ecology. Family workshops with a wildlife theme and an evening of live per- formance are also planned at Hermon Chapel. Further events exploring the hillfort’s flora and fauna are set to follow through 2017 under an educational initiative called the ‘Hillfort Watch’. Allied group, Artists Hugging the Hillfort (AHH! ), is currently showing a retrospective of hillfort initiatives and art- work called ‘Heritage Matters’ at the Oswestry Heritage and Exhibition Centre. Running until the end of February, it traces HOOOH’s evolution from campaign to community group working in the broadest interests of the hillfort.